I didn’t know the name of the church when we took the decision to visit Ethiopia. I remember seeing the photo of the monastery carved out of the stone in an old travel book. 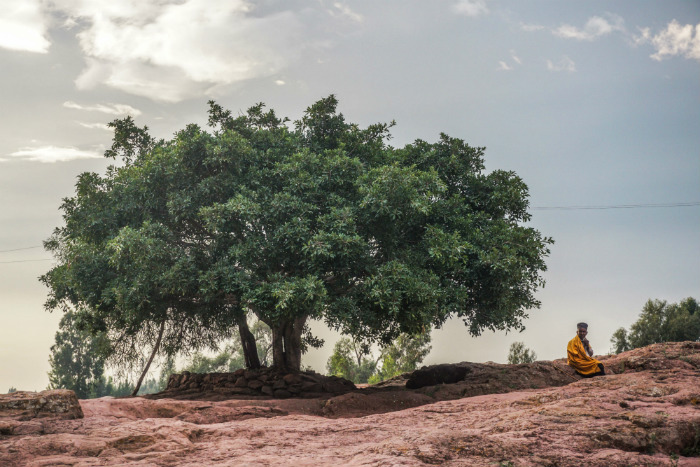 Bete Giyorgis, Saint George, is one of the iconic landmarks of Ethiopia. As we prepared for our trip to Ethiopia I knew the monastery in Lalibela would be at the top of my ‘to do’ list (though on reflection the Danakil Depression Tour was more interesting). 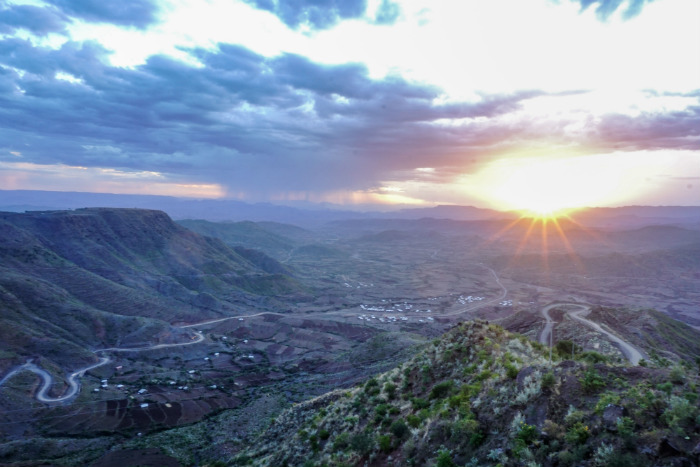 As we researched our itinerary we quickly realized Lalibela was going to be hard to get to. The town is a 14-hour’ish indirect bus ride from Addis Ababa. We decided to fly. It would take 90 minutes. We flew into Lalibela Airport in the late morning. The flight was fully booked. Staring out of the cabin window I could see red scrubland that stretched into the distance in every direction. Tall hills and cliffs cut up the landscape. It looked like the setting for a Western. Lalibela Airport is 30 minutes out of town. We took a shared taxi into town. The road cut across the open plains until it slowly twisted and turned up the hills and through the sprawling outskirts of the town. Our hotel was in the center of Lalibela. It was a mid-range spot, simple, but comfortable. The room had a balcony overlooking the plains and the old part of town. After settling into the hotel and having an Ethiopian coffee with salty popcorn we took an evening stroll around the city. I’m not sure what I expected from Lalibela, I thought there would be more tourists (and more tourist money), but Lalibela has the feel of a forgotten provincial backwater. The first thing we saw as we stepped out of the hotel were two kids peeing in patterns on the dusty street. Men wearing cheap green women’s plastic sandals watched us or sat in groups in the shade of old adobe buildings. We went for a stroll. We took a looping route round Lalibela. As we hit the edge of the old town we passed a boy taking a poo by the side of the road. It was that kind of town. We turned round and headed home as the flies buzzed around us. It sounds depressing, especially as Lalibela is a UNESCO World Heritage Site (there’s definitely a post I want to do on this). We returned to the hotel and had a nice meal at the hotel restaurant. The next day we woke up just after sunrise and trekked down to the ticket office. The ticket to Bete Giyorgis and the surrounding monasteries was $50 per person. It’s quite expensive. After paying the money to an old man in the ticket office we walked down to Bete Giyorgis Monastery. The site was almost empty when we arrived. A sleepy guard checked our ticket. We walked around the top of the site. The church is shaped like a cross and carved straight out of the ground using simple metal tools. It took decades to complete, yet as a tourist, there’s not much to it. Puddles covered the stone floor of Bete Giyorgis and supporting scaffolding covered one section of the church. I poked my head through the main door of the church. The interior was plain with fabrics hanging from the walls. The other site we visited in town was Bette Abba Libanos. The monastery is larger than Bete Giyorgis. It’s more of a complex with a few different buildings. Old pilgrims sat in groups playing with prayer beads and reading the bible. Unless you are really interested in your religious history Lalibela is a one hit wonder. There are dozens of churches around the town, and they are all included in your three-day ticket, but… most of the people we met, ourselves included were only interested in visiting one or two spots. We stayed in Lalibela for four days and visited the same number of sites. It was nice to visit and there were some easy-going things to do around town. We walked up to the hills at sunset to look out over the countryside. Another highlight was the Ben Abeba restaurant, which has a funky design and offers great views at sunset. It’s a nice place for a few drinks and the atmosphere is nice, but the food was nothing to write home about. Have you ever visited Lalibela? What did you think of the town? Share your thoughts in the comments below. Great and very informative blog posted here. Thanks for sharing such an amazing blog with us. I just really love to travel different places in the world.